The German chamomile variety contains the highest concentration of the essential oils responsible for giving medicinal chamomile tea its healing power. "To ease the body's pain, the Lord sent chamomile." This line from a nineteenth-century poem validates how important chamomile has been in alleviating pain and discomfort throughout time. In fact, the medicinal use of chamomile dates back even further to the days of the Romans, who relied on its antispasmodic and anti-inflammatory properties. Today, chamomile tea is one of the most effective medicinal teas known. The gentle action of this herb tea makes it suitable for children and adults, and the tea can be safely used on a regular basis. Click on this link, Incredible Chamomile , for more information about the incredible benefits of our favorite medicinal herb. To be prepared when stomach aches , insomnia , sore throats or cramps strikes, keep a supply of chamomile flowers on hand. Warning Chamomile has been known to cause allergic reactions in people who are allergic to ragweed or other members of the daisy family. If you have such an allergy, you should avoid using this medicinal herb. In a teapot place 1 teaspoon of chamomile flowers per cup of water. Boil the water, than let it cool slightly (using boiling water will cause the various therapeutic compounds in chamomile to evaporate). For best results, steep the tea less than 5 minutes. Strain and enjoy. Use 1 teaspoon of the mixture per cup of hot water. Steep this mixture 10 minutes and strain. This tea soothes the gastrointestinal tract and stimulates digestive activity, making it useful for stomachaches or a too-full feeling. Caution Never give an infant or young child a medicinal tea with peppermint in it. The menthol in the peppermint could have a reverse reaction. Use 1 teaspoon of this mixture per cup of hot water. Steep this mixture 5 minutes and strain. The anti-inflammatory components of this tea relieve bladder pain and urinary discomfort. Drink as much tea as you wish daily until the inflammation has healed. Use 1 teaspoon of this mixture per cup of hot water. Steep this herbal tea 5-10 minutes and strain. This medicinal tea blend stimulates metabolic activity, which helps promote the healing of inflammatory skin conditions , such as rashes, abscesses, boils and acne. The healing effect of chamomile is due primarily to the chamazulene and alpha-bisabolil in its essential oil. Chamomile has analgesic, anti-inflammatory, antispasmodic and antibacterial effects. It also helps calm the nerves and induces sleep. 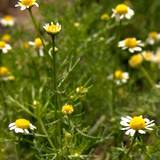 In addition to being drunk, medicinal chamomile tea can be used in healing compresses or added to bathwater. The essential oil in chamomile, combined with other ingredients, such as sulfur and calcium, help relieve gastrointestinal inflammation. To ease pain and stimulate the digestion, drink 3 to 4 cups of freshly prepared tea daily for a period of several weeks. The flavonoids in chamomile tea can prevent gas and relieve cramps. However, for menstrual cramps, a chamomile tincture is better because its flavonoid concentration is a third higher than that of the tea. Chamomile-tea compresses help relieve eye pain, eyestrain and eyelid inflammation. Soak 2 cotton pads in lukewarm tea and place them on the eyes for a few minutes. Warning: Strain the tea thoroughly first, to remove any pieces of chamomile flower that may irritate delicate eye tissue. A medicinal chamomile tea bath provides quick relief from skin inflammations, restlessness and insomnia. Add 1 quart of chamomile tea to a bathtub full of warm water. For insomnia, take the bath before bedtime. A chamomile tincture can alleviate menstrual cramps. 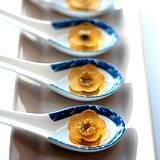 To make the tincture, add 2/3 ounce of chamomile flowers to 1 ½ of 100-proof alcohol and let it steep for 1 week. Strain and store in a dark vial. Take 10 drops in a glass of water. 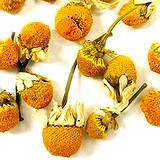 The germicidal effect of a chamomile vapor helps destroy the germs that cause flu and alleviates coughing. Pour 2 quarts of hot water over 2 cups of chamomile flowers,. Cover your head with a towel and inhale the vapors. Warning: Do not use this method if you suffer from cardiovascular disease.